When students in the art of the tattoo apprentice under a seasoned artist, they primarily focus on holding the tattoo machine correctly and using proper strokes for lining and shading. While these facets of tattooing are essential for creating good skin art, they are only part of the equation. A tattoo artist is only as good as the quality of his stencil. 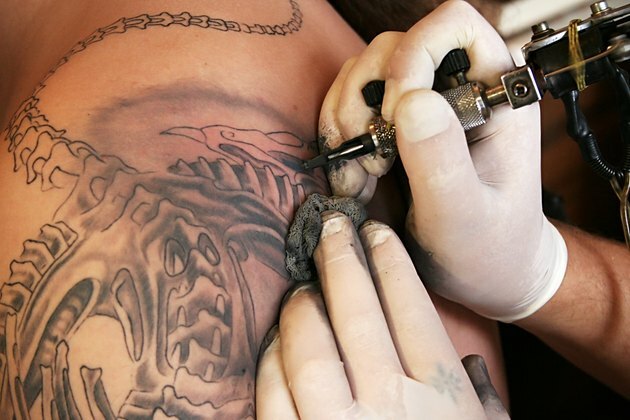 According to SkinInkToday.com, 12 percent of people who regret getting their tattoos do so because they do not like the way their skin art looks. Proper stencil transfer can help you avoid creating a tattoo your client will regret. You should always shave the tattoo area before applying the stencil, according to InkSling.com. This holds true even if there is no visible hair. Shaving also removes loose, dead skin cells that can flake off during the tattooing process. This technique will help ensure that the stencil remains visible throughout the tattooing session. Let the stencil dry completely before transferring it to the client's skin. If your client is pressed for time, you may be tempted to transfer it to her skin as soon as it is done. Unfortunately, this can cause smudging, making it difficult to render your tattoo art accurately. Let the stencil air dry for at least 10 minutes to minimize the possibility of smudging. Cover the tattoo area with a thin coat of a stencil transfer medium before applying the stencil. The transfer medium allows the pigment from the transfer fluid to remain on the skin after you remove the stencil. InkSling.com recommends using clear Speed Stick deodorant, although some shops now use a transfer fluid designed specifically for tattoo stencils. Some tattoo artists tend to run their fingers across the back of the stencil after placing it on the skin to make sure it adheres smoothly. According to InkSling.com, you should pat the stencil instead. Patting the stencil helps reduce the chance of smudging, while smoothing it out with your fingers can cause the stencil to move, creating a blurred stencil image.